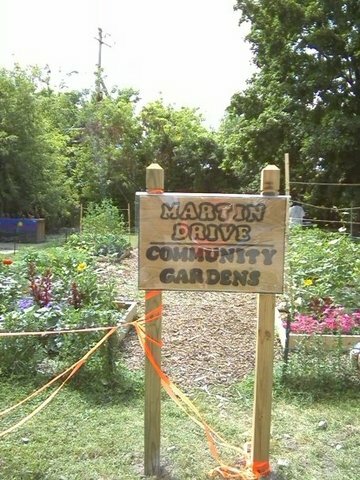 Community Gardens - The Martin Drive Community Garden was established in the spring of 2009 when a new Martin Drive resident with a green thumb presented the idea during a neighborhood meeting. The project has connected neighbors, created opportunities for young residents to learn about and taste a cornucopia of fresh fruits and vegetables. It has also established a pretty, peaceful meeting place in the Martin Drive Neighborhood. Annual Picnic - Neighbors in the Martin Drive Neighborhood have an annual picnic the last Saturday in July. This year along with great food and over 80 neighbors, enjoyed guest appearances from Alderman Michael Murphy, McGruff the Crime Dog, Milwaukee Police, and Milwaukee Firefighters. Children enjoyed facepainting, games, checking out the firetruck and squad and great food that neighbors brought to the picnic. 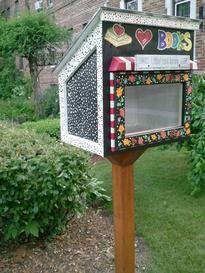 Little Free Libraries - Little Free Library, a movement started by Todd Bol of Hudson and Rick Brooks of Madison in 2010, has grown to include little libraries in most states and dozens of countries. 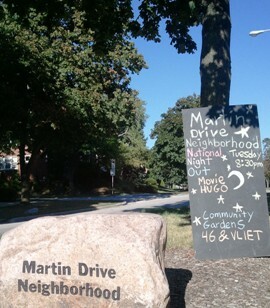 Look for Martin Drive Neighborhood's as a great way to foster a sense of neighborhood and promote literacy for children and families at the same time. Outdoor Movies - During the summer months, at Sunset, enjoy a movie at our Community Garden (46th & Vliet). Bring a blanket, snacks, and enjoy a movie with your neighbors. Night-Time Trick and Treating - Martin Drive Neighborhood always celebrates Night-Time Trick and Treating on the Friday closest to Halloween with many kids and families participating each year. 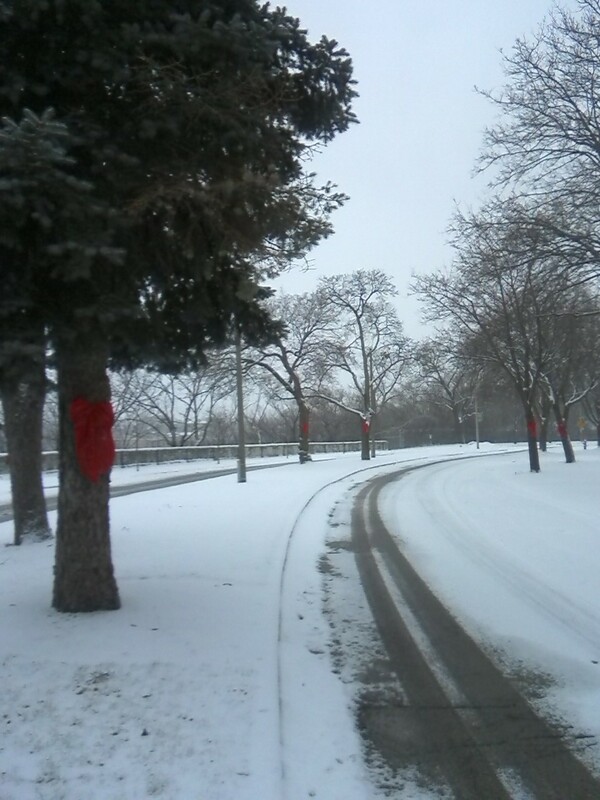 Red Bows - Red holiday bows, almost 500 of them, are placed on every tree in the neighborhood. It's been a neighborhood tradition for over 10 years and the neighborhood continues to receive compliments! Holiday Caroling and Potluck - Always the second Monday in December, 6:30 p.m. The Martin Drive Neighborhood has an annual holiday party instead of a neighborhood-wide meeting in the month of December. Neighbors walk the neighborhood together singing holiday tunes. A potluck party follows. Rummage Sale - The Martin Drive Neighborhood Association sponsors an annual neighborhood-wide rummage sale. Neighbors sign-up their houses and the Association takes care of marketing the event. Neighborhood Pride - The Martin Drive Neighborhood always thinks about curb appeal, making the home look attractive from the curb. ​​​​​Light Brigade - Better lighting makes neighbors feel safer and scares away criminals! Musical Extravaganza Fundraiser - An annual music concert to help support the neighborhood. Game Nights - Twice a year, the Friday before President's Day and a host-decided Friday night in August: A night of games and fun with neighbors! What Activities does the Martin Drive Neighborhood offer?